- 24" thermopile Armoured 750 . 74L57 - Installation and service must be performed by a qualified installer, service agency, or the gas supplier. HHT 446-511 - No generics. Part # 446-511. For models: qv32 qv32-a qv32b qv32b-a pre serial # 0021080519 qv36 qv36-a qv36b-a pre serial # 0021076968 qv36d qv36d-a qv36db qv36db-a qvi25 qvi30 qvi35 qvi-25fb qvi-30fb qv pier heat n glo gas stoves: at-grand also fits the b, c and d models at-insert at-supreme also fits the b, c and d models at-zc and at-zc-b bay insert and bay insert ns cfx grand-b cfx-in-b fb-grand fb-in fb-zc grand-i35-sp grand-xt supreme-i30-sp supreme-xt zc-xt bay-38hv bayfyre-trs bay-gdv-95 - after may 1996 l-cor-tr l-cor-trc l-cor-ipi pier-38hv pier-tr pier-trc pier-tvfl r-cor-tr r-cor-trc r-cor-trc-ipi st-38hv st-42tvfl st-tr st-trc 6000be 6000camp 6000dvtfl - after serial # 12614 6000fls 6000g 6000gbv 6000gdvfl - after date code 2/96 only for 30 sec pilot assembly 6000seb 6000trb 6000tri 6000tri-sp 6000tr-nf 6000tr-oak 6000trxi 6000tvb 6000tv-oak 6000xl 6000xls 6000xls-nf 6000xlsb 6000xlt 6000xlt-nf 6000xltb 7000tr-nf 7000tv-nf 7000xls-nf 7000xlt-nf 8000c & nd3630l replacement rs robert shaw thermocouple for hearth & 8000c-lp 8000dvtfl - after date code 2/96 8000gdvfl - after date code 2/96 8000tr 8000trc 8000trd 8000tr-oak - pre serial # 0021116425 8000tvc 8000tvd 8000tv-oak - pre serial # 0021116948 be-41 be-41b be-41b-ipi everest - pre serial # 5000 be-32 - pre serial # 2107620 be-36 be-36-c - pre serial # 0021076020 sl-32 - 30 second valve sl-32gdv sl-32s sl-36 sl-36gdv sl-36s sl-42 sl-42dvt sl-350dvt sl-350trs sl-350trs-c - pre serial # 0021080044 sl-350tv sl-550tr sl-550tr-c sl-550tr-d - pre serial # 0021076206 sl-550trs sl-550trs-b sl-550trs-c sl-550tv sl-550tv-c sl-550tv-d - pre serial # 0021076055 SL-750TR SL-750TR-C SL-750TR-D - Pre serial # 0021076251 SL-750TRFL SL-750TRS SL-750TRS-B SL-750TRS-C SL-750TV SL-750TV-D - Pre serial # 0021076242 SL-950TR SL-950TR-C SL-950TR-D - Pre serial # 0021076046 SL-950TV SL-950TV-C SL-950TV-D - Pre serial # 0021076046 SL-3000 SL-TVBLD Bay Stove Townsend I Townsend II - Standing pilot only Heatilator Gas Stoves: ADI60 ADI-ZC-FB NDI30-SP NDI30-SPFK NDI35-SP NDI35-SPFK ND3630 & Home Gas Stoves and Fireplaces. Fit's many models - 27. 5 inches Long. Original quadra-Fire HHT Parts. Fixitshop Corp. 51-1502 - Thermocouple for direct vent fireplaces fits heatilator & heat-n-glo replacement Thermocouple for Direct Vent Fireplaces Replaces replacement for Robertshaw 446-511 Fits Robertshaw & some SIT 820 NOVA Gas Valves with fine thread. Replaces replacement for Robertshaw 446-511. Works on many fireplaces part numbers 34820 446-511 72956 Replacement rs robert shaw Thermocouple for Hearth & Home Gas Stoves and Fireplaces. Original quadra-Fire HHT Parts. Part # 446-511. Fits robertshaw & some sit 820 NOVA Gas Valves with fine thread. Works on many fireplaces. No generics. Part numbers 34820 446-511 72956. Fit's many models - 27. 5 inches Long. Thermocouple for Direct Vent Fireplaces. 74L5701 - No generics. Thermocouple for Direct Vent Fireplaces. Part # 446-511. Fit's many models - 27. 5 inches Long. Original quadra-Fire HHT Parts. Replaces replacement for Robertshaw 446-511. Fits robertshaw & some sit 820 NOVA Gas Valves with fine thread. Works on many fireplaces. Replacement rs robert shaw Thermocouple for Hearth & Home Gas Stoves and Fireplaces. Part numbers 34820 446-511 72956. HHT 2103-512 - Replaces replacement for Robertshaw 446-511. Part # 446-511. Replacement pse thermopile for Hearth & Home Gas Stoves, Log Sets and Fireplaces. Original quadra-Fire HHT Parts. Quadra-fire gas stoves: qv32 qv32-a qv32b qv32b-a qv36 qv36-a qv36b-a qv36d qv36d-a qv36db qv36db-a qv36dc-a qvi25 qvi30 qvi30s qvi35 qvi35s qvi-25fb qvi-25fb-s qvi-30fb qvi-30fb-s qvi-35fb-s heat n glo gas stoves: 4000inc 4000ins at-grand also fits the b, c and d models at-zc and at-zc-b bay insert and bay insert ns cfx grand and cfx-grand-b cfx-in and cfx-in-b cfx-zc dvt insert fb-grand and fb grand-s fb-in and fb-in-s fb-zc and fb-zc-s grand-i35-sp grand-xt and grand xts mlt-insert sl-insert and sl insert-b supreme-i30-sp supreme-xt and supreme xts zc-xt bay-30 bay-38hv bayfyre-trs bay-gdv-95 bay-gdv l-cornerdv l-cornertv l-cor-tr l-cor-trc l-cor-ipi l-cor-tvfl pier-38hv pier-dvt pier-gdv pier-tr pier-trc pier-tv pier-tvfl r-cornerdv r-cornertv r-cor-tr r-cor-trc r-cor-trc-ipi r-cor-tvfl st-38gtv st-38hv st-42fl st-42gtv st-42tvfl st-dvt st-gdv st-tr st-trc 36dv88 4000gdv 4000tv 4000wh 5000gdv 5000tv 6000arch 6000be 6000c 6000camp 6000cf 6000dvt 6000dvtfl 6000fls 6000g 6000gbv 6000gdvfl & 6000tvfl-nf 6000tv-oak 6000xl 6000xls & 6000xlt-nf 6000xltb 7000tr-nf 7000tv-nf 7000xls-nf 7000xlt-nf 8000dvt 8000dvtfl 8000gdv 8000dvtfl 8000tr 8000trc 8000trd 8000tr-oak 8000tv 8000tvc 8000tvd 8000tvfl 8000tv-oak be-41 be-41b be-41b-ipi be-41c cfx-36tsp everest - pre serial # 5000 gas36tV Grand-50 BE-32 - After serial # 2107620 BE-36 Not listed, C and D models AT-Insert AT-Supreme Also fits the B, due to the size of the list, are other Heat & 6000XLS-NF 6000XLSB 6000XLT & 6000GDVFL-NF 6000SEB 6000SGDV 6000TRB 6000TRI 6000TRI-SP 6000TR-NF 6000TR-OAK 6000TRXI 6000TV 6000TVB 6000TVFL & Glo and Heatilator units that this Thermopile fits. Thermopile Fits Many Units. Fit's many models - 27. 5 inches Long. Hht part #2103-512 replaces previous Part # of 060-512. Contact our store with your make and model to see if this Thermopile works on your unit. Made In China - D. Specifications: length 24" rating: 750 mv The thermopile is used with 750 millivolt pilot systems. Replaces replacement for Robertshaw 446-511. C. No generics. It has been proven in millions of appliances as the contractor's preferred thermopile and are found in many of today's self powered gas fireplaces. Part # 446-511. Fit's many models - 27. 5 inches Long. C. Thermocouple for Direct Vent Fireplaces. The honeywell cq200a has been proven in millions of appliances as the contractor's preferred thermopile and are found in many of today's self powered gas fireplaces. 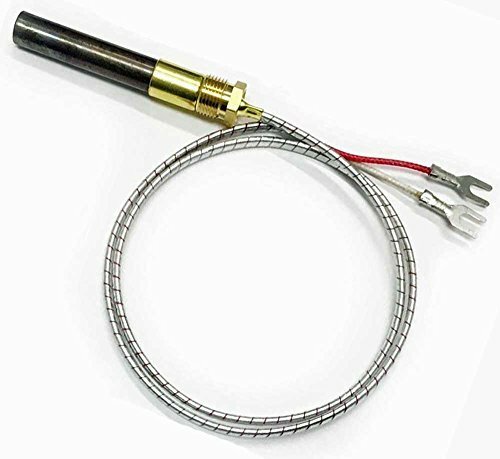 Lengths: 24 inches （609mm） 750 millivolt Replacement Thermopile Generators have long been used in self-powered heaters and hot water equipment. EARTH STAR 750 degree Millivolt Replacement Thermopile Generators Used on gas fireplace / water heater / gas fryer Cluster thermocouple - Original quadraFire Parts, No Generics. Internal resistance 25°c, 500 mΩ and 4, varies with specifications and length between 1, 500 mΩ. This system is generally found on gas fireplaces and gas logs that use wall switches or remote controls. Original quadra-Fire HHT Parts. Thermopile Fits Many Units. Fits robertshaw & some sit 820 NOVA Gas Valves with fine thread. 26D0566 - Original quadraFire Parts, No Generics. No generics. Original quadra-Fire HHT Parts. Internal resistance 25°c, 500 mΩ and 4, varies with specifications and length between 1, 500 mΩ. B. Replacement pse thermopile for Hearth & Home Gas Stoves, Log Sets and Fireplaces. Quadra-fire, heat & Glo and Heatilator Thermopile. Normal working temperature 700-750°C. Specifications: Length 24" Rating: 750 mv. Replaces replacement for Robertshaw 446-511. Part numbers 34820 446-511 72956. Hht part #2103-512 replaces previous Part # of 060-512. Thermopile Fits Many Units. C. Part # 446-511. Look for our store gas components store, this product does not authorize any shop channel sales, purchase from other shops are fakes, can report claims A-Z. Monessen 26D0566 Gas Fireplace Thermopile Thermogenerator - A. Fit's many models - 27. 5 inches Long. Lengths: 24 inches （609mm）from shop GAS COMPONENTS STORE. Fits robertshaw & some sit 820 NOVA Gas Valves with fine thread. MENS - Internal resistance 25°c, 500 mΩ and 4, varies with specifications and length between 1, 500 mΩ. Normal working temperature 700-750°C. Connecting type: spiral type and two-pole plug-in type. Original quadraFire Parts, No Generics. Look for our store gas components store, purchase from other shops are fakes, this product does not authorize any shop channel sales, can report claims A-Z. A. Fit's many models - 27. 5 inches Long. Lengths: 24 inches （609mm）. Replacement pse thermopile for Hearth & Home Gas Stoves, Log Sets and Fireplaces. Fits robertshaw & some sit 820 NOVA Gas Valves with fine thread. Works on many fireplaces. Normal working temperature 700-750°C. Specifications: Length 24" Rating: 750 mv. MENSI 24" Fireplace Millivolt Replacement Thermopile Generators 750℃ temperature resistance - Connecting type: spiral type and two-pole plug-in type. D. Quadra-fire, heat & Glo and Heatilator Thermopile. Replacement rs robert shaw Thermocouple for Hearth & Home Gas Stoves and Fireplaces. Hht part #2103-512 replaces previous Part # of 060-512. White-Rodgers H06E-24 - Original quadra-Fire HHT Parts. Universal adapter fittings included with each kit for replacing thermocouple in most types of pilot burners. Works for both LP and natural gas applications. Universal Thermopile. Connecting type: spiral type and two-pole plug-in type. D. Lengths: 24 inches （609mm）from shop GAS COMPONENTS STORE. Thermocouple for Direct Vent Fireplaces. Part numbers 34820 446-511 72956. Original quadraFire Parts, No Generics. Internal resistance 25°c, 500 mΩ and 4, varies with specifications and length between 1, 500 mΩ. Normal working temperature 700-750°C. Connecting type: spiral type and two-pole plug-in type. No generics. Emerson H06E-24 Universal Thermocouple, 24-inch - Replacement rs robert shaw Thermocouple for Hearth & Home Gas Stoves and Fireplaces. Normal working temperature 700-750°C. Specifications: Length 24" Rating: 750 mv. C. Look for our store gas components store, this product does not authorize any shop channel sales, purchase from other shops are fakes, can report claims A-Z. Robertshaw 1980-024 Replacement Thermocouple, Snap Fit, 24"
Honeywell CQ100A1021/U CQ100A1021 Replacement Thermocouple for Gas Furnaces, Boilers and Water Heaters 18"
Vermont Castings - Quadra-fire, heat & Glo and Heatilator Thermopile. Fits robertshaw & some sit 820 NOVA Gas Valves with fine thread. Works on many fireplaces. Installation and service must be performed by a qualified installer, service agency, or the gas supplier. Replacement pse thermopile for Hearth & Home Gas Stoves, Log Sets and Fireplaces. Replaces replacement for Robertshaw 446-511. Normal working temperature 700-750°C. Specifications: Length 24" Rating: 750 mv. Connecting type: spiral type and two-pole plug-in type. D. Part numbers 34820 446-511 72956. Internal resistance 25°c, varies with specifications and length between 1, 500 mΩ and 4, 500 mΩ. Vermont Castings Monessen Majestic Thermocouple 24D0808 OEM - Normal working temperature 700-750°C. Connecting type: spiral type and two-pole plug-in type. Lengths: 24 inches （609mm）from shop GAS COMPONENTS STORE. Fit's many models - 27. 5 inches Long. Lengths: 24 inches （609mm）. Original quadra-Fire HHT Parts.